Last week, I was really proud to be part of the team that announced that we’re testing new versions of our vehicle tax and SORN Service. These versions have been released into public beta, which means that it’s not a finished product, but something that is good enough for people to use and provide feedback on so that we can make it better. Some of the team members involved. Well, as a customer wanting to tax a vehicle online, you have the choice to use either the existing version, or the new beta version of the service. We've developed the beta version to be simpler and quicker to use, with the added benefit of being developed in-house, which means that any changes suggested by customers can be made more efficiently. The beta will replace the existing vehicle tax online service later in 2014, and the team is already working to get this done. So, how have we developed these new screens and how is this different to the development of existing online services? 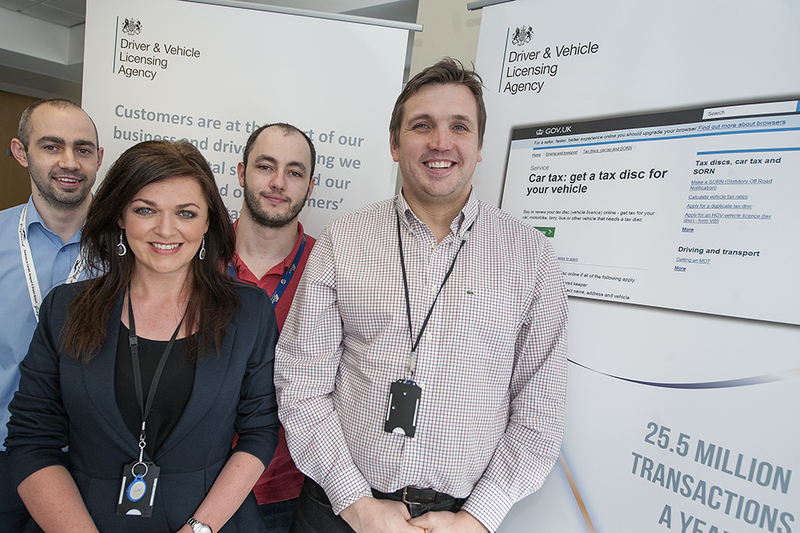 It all began in October 2013 when the ‘online vehicle tax screens’ project team was created. The team consisted of a small number of core individuals from DVLA’s in-house development team, supported by specialist suppliers as required, e.g. to link to existing services. An Agile approach was adopted by the team from the start, which enabled us to deliver the new screens more quickly, and at a lower cost. The new screens were designed and built in a series of sprints over a 7-week period. This is one of the first projects at DVLA to be completed using an Agile approach. The team has demonstrated and proved that Agile ways of working can work really well here at DVLA. We originally thought that the new online vehicle tax screens were going to take 6 months and in excess of £600,000 to deliver. I have found it amazing that in actual fact the team was able to not only halve the original cost estimates, but also find time to offer a new version of SORN and vehicle enquiry check services. We also removed a whole load of back end processing and duplication to boot! This has largely been possible because of the flexibility offered by using our in-house team and this also makes it easy to incorporate any new changes at real pace and at greatly reduced cost. In the first 6 days of operating, the beta service had already taken £2 million in vehicle tax. A really big positive for us, our new ways of working, and ultimately our customers. Hi Ken, The legislation affecting SORN changed in December 2013. The new legislation means that once the registered keeper of the vehicle has notified DVLA that their vehicle is on a SORN declaration, they will no longer have to renew their SORN annually.